Back when the Guardian of the Forest Bath Bomb first came out it was an Oxford Street exclusive, this meant that it was only available in one store in the whole world. I’m incredibly lucky as I have been able to visit Lush Oxford Street several times since it opened its doors in April 2015. I also have a wonderful sister in law that lives a short bus ride away from the store therefore getting a hold of the exclusives was and is a lot easier for me than others. Lush have however recently made all of the exclusive to Oxford Street products available to buy via the Lush Kitchen on their UK website, getting a hold of the exclusive products is now much easier for everyone, no matter where you are in the world. The Guardian of the Forest bath bomb is 2 shades of green. It has an intricate raised leaf pattern that makes it unique to any other Lush bath bomb. If I was describing it in a book I would compare it to an enchanted and somewhat handsome looking cabbage, ha, ha! The Guardian of the Forest bath bomb contains cypress and rosewood oils which is what gives this bath bomb that woody, fresh-forest-scent. It also contains lime oil although I couldn’t personally detect any scent wise. I think the cypress and rosewood oils softens the kick of the lime somewhat. What I thought was going to be a zesty and refreshing bath bomb was actually very earthy and spicy. 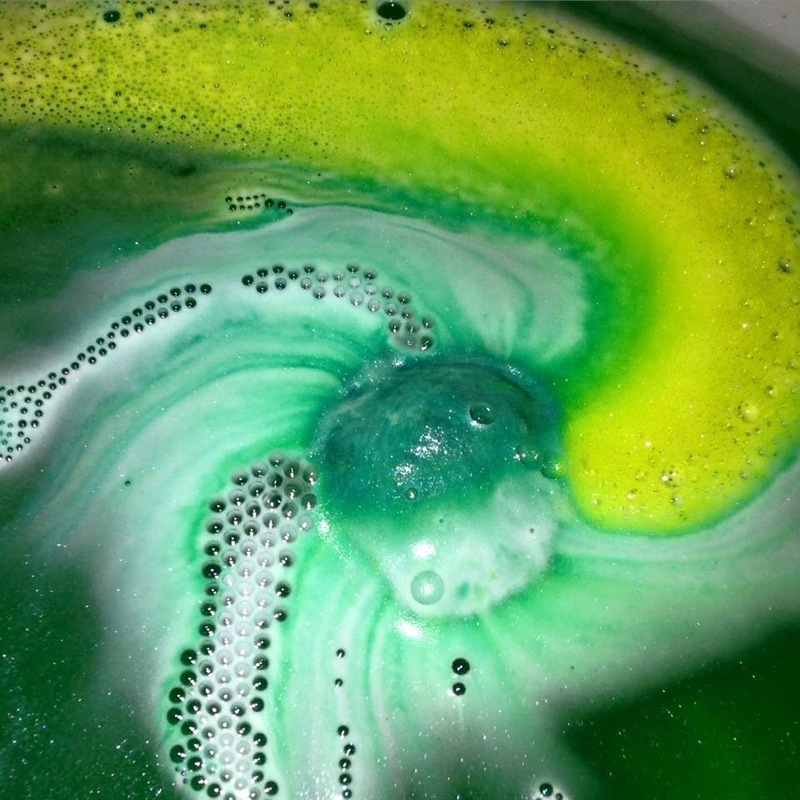 I have however read reviews of this bath bomb online and quite a few people are describing Guardian of the Forest as having a REALLY citrusy scent. The citrus products are normally my favourite, we just seem to gravitate towards each other, I just can’t smell any lime in this bath bomb at all. With people describing Guardian of the Forest’s scent as incredibly citrusy, I feel like I have missed out on something? Regardless of the mystery of this bath bombs ‘hidden’ citrus scent, I really do enjoy using the Guardian of the Forest bath bomb. 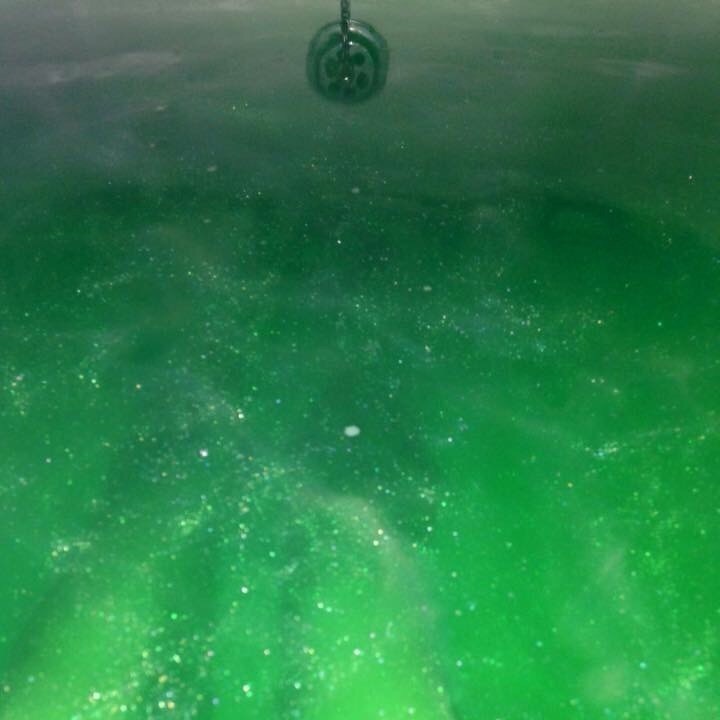 Once the bath bomb has completely dissolved you are left with gorgeously-green, lustre filled bath water. When I very first used it I couldn’t help but think of the, The Wizard of Oz. Soaking myself in a Guardian of the Forest bath leaves me feeling relaxed and carefree. My skin really enjoys itself too, most bath bombs soften my skin somewhat, this bath bomb is however a little more luxurious, it makes my skin feel incredible. It looks brighter and is super smooth for the rest of the day after using it. This is amazing!! I always want to try the bathbombs but I’m not much of a bath person so I don’t want to waste them but this looks gorgeous! Lush products are amazing!!! “An enchanted, handsome cabbage” lol I love that! I’ve never heard of lime oil and it’s too bad you couldn’t detect the citrus scent. I like citrusy scents too. I would love to try this one too if I can find it at my local lush.